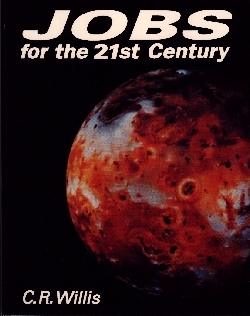 "JOBS for the 21st Century"
This is a full length 8.5x11 book which describes in detail the development of space, the new propulsion system, the full mission to Mars, a manned mission to Jupiter, and other interesting subjects such as the spaceship design and the hydroponic food production system. All text, tables, and other materials presented on this site and relating to this book are copyrighted by Christopher R. Willis and are for your personal use only. 2.3 Are these numbers for real? 7.6 What has to be taken to the moon? 11.2 Should we finance a Mars sample-return mission?